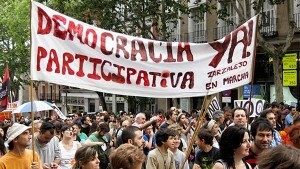 Stirring Trouble Internationally: Are these Spanish demonstrations? Why is Madrid a Eurozone? Are these Spanish demonstrations? Why is Madrid a Eurozone? Hundreds of thousands are protesting against Big Brother’s cuts in spending and raising of Spanish taxes. This week Spain has been forced to raise taxes, this is bad news for students and people working in Spain. Taxes are what keeps the economy going. The problem is that taxes have always been exclusive to the country that delegate these levies. Generally this money would be put back into digging up roads and helping people who are sick. Things have changed and it is all because of Europe and the shape it took and the directions it's making. The truth is nobody knows, until you get to the airport. There you will see the recession has hit hard. Building is terminated leaving semi building sites. No one likes to say they are skint. Spain is a rich country of Europe and have been exporting oranges from Seville for a number of years. The Satsuma's have also done surprisingly well, but none of these fruits are enough to stabilise the demise of the Euro. What has happened in Europe that has effected Spain? You see a short while ago Spain and many other countries joint ventured with Greece. Switzerland was another partner in the deal. Iceland agreed, Ireland agreed. All these countries now are also campaigning against tax cuts. Tax cuts are happening everywhere. As the bills increase so do the taxes. The Euro is just a by product of all these troubles. So protesting in Spain is no different to the rest of the world's protests. In fact they are much more behaved as you will find out when you go over to Stirring Trouble Internationally. Is this really a protest or is it a gay pride festival? Gay Pride was this week in Spain according to Stirring Trouble Internationally, they have there eye well on the calendar, but no this is an image of protesters in Spain campaigning against the rise in taxes. Protesting has been very popular with students ever since the 1960's. France was at the forefront of a lot of these marches. France like Germany have always been avant garde when it came to the young getting together and having a good time. What can Spain do to solve the financial problems in Europe? Not much really the best thing they could do is export more and localise everything. If everyone get together and provide each other with things at affordable prices they should be ok. You see this European venture is costing a lot of money. No longer is Spain using peso's they are now using Euro's. Perhaps they could take a look at what Ireland and Germany are doing that may help. Last week Germany had a meetup with British leaders to find out what they thought. The conversations went on all evening but nothing much was announced. Other than that Britain was well pleased not to be affiliated with the Euro currency and that we would be thinking of them and there problems. The best part of any holiday to Spain or anywhere else is the journey back home. As you get to the airport you are reminded of the architectural poverty and when you get home you greeted with change banners plastered all over the posh landscape. It's only when you get back to the ranch via diversions and road diggers that life is not all a bed of roses or caste-netts.